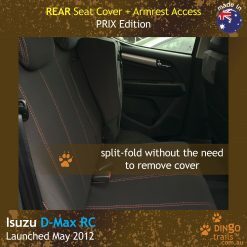 View cart “STANDARD Front & REAR Seat Covers + Armrest Access for Isuzu D-Max (ID12-HB+Rz-P)” has been added to your cart. 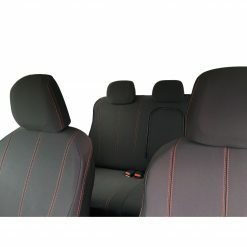 Full-back Front Seat Covers protect the whole of your front seat including the back of the backrest from cargo damage and annoying people kicking the back of your seat. 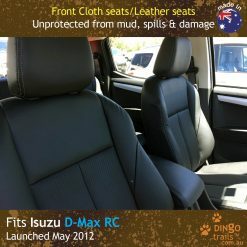 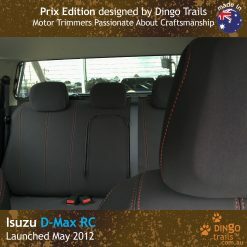 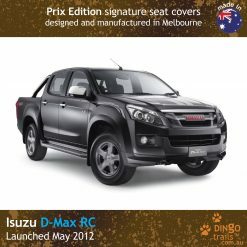 Custom made to fit perfectly on your Isuzu D-Max, they're durable & made right here in Australia. 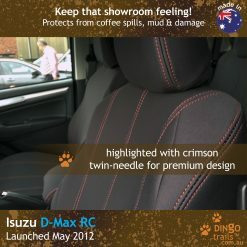 Buy these premium covers becasuse they're tradie-tough, UV+water resistant & proven to last as they're made from automotive grade neoprene. 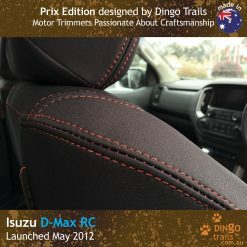 For compatibility, read Tab below. 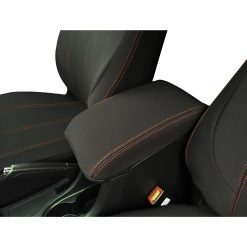 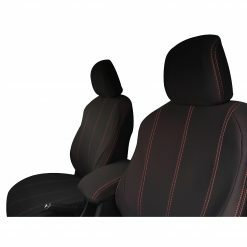 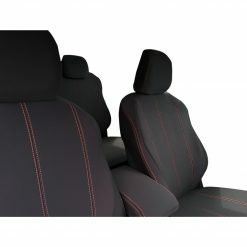 This listing is for 2x Full-back Front Seat Covers suitable for “Front Bucket Whiplash Protection Seats” (see photos) in the following vehicles. 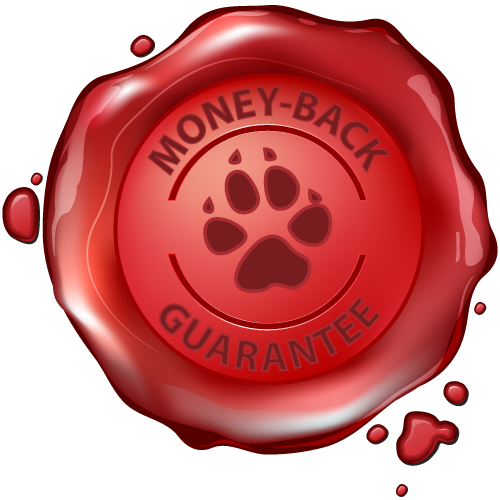 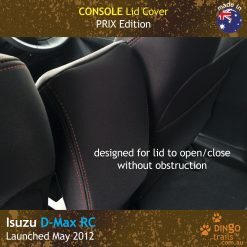 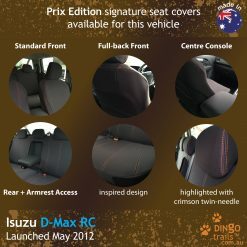 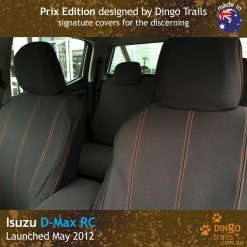 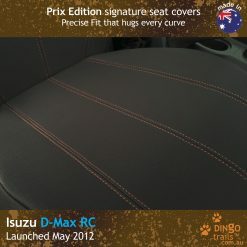 For full protection, we also recommend purchasing the matching Prix Edition Console Lid Cover for “Centre Console”. 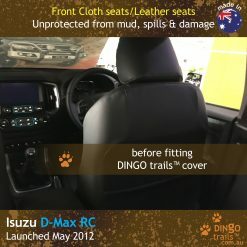 Prior to December 2013, Rear Seat did not include centre headrest or centre armrest. 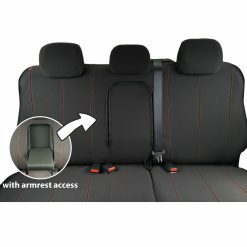 As the dimensions of the Rear Seat remain the same, "Rear Seat Cover with Armrest Access" will still fit. 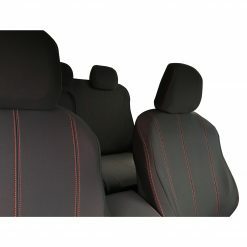 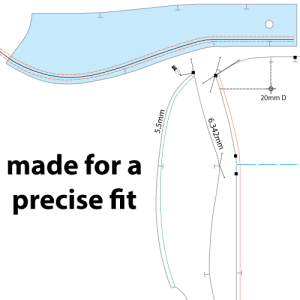 Charcoal black neoprene highlighted with Crimson accented twin-needle stitch. 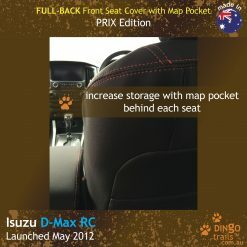 Prix design.